But yesterday, while having dinner with friends, I scarfed down all the roasted garlic I could out of the yummy salad my friend had brought to share. Even after dinner, and even after my ice cream sundae, I continued to casually pass the kitchen counter, picking garlic hunks out of the salad inconspicuously,(or so I hoped.) Think my body was trying to tell me something? This morning I awoke feeling remarkably better, and more like my usual self. Also, I awoke smelling like a very well used garlic press. Yummy. But man was it worth it. It was so worth it I cooked myself I grilled onion,garlic & cheese sandwich for lunch. Which came after the Mint Chocolate Chip Ice Cream Cone I had for breakfast, with my coffee…. So there Mom, you were right!! Garlic heals!! But enough about that, let’s move on to prettier, less smelly things shall we? This is my new little “sewing” space in my studio. 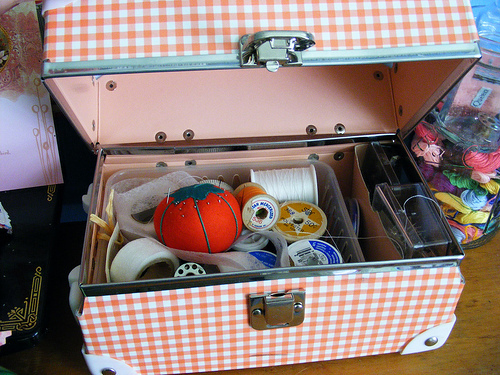 Not that I will sew in that exact space, more this is the space where I am keeping all my sewing goodies. and My Blue Girl, all dressed up and ready to mend. Part of my big spring cleaning project has been to get the boys room more organized, so 2 shelves left the Studio and moved down the hall to their room, where they are already filled to the brim. This gave me a little space to maneuver around my big old craft desk and the opportunity to get rid of a lot of junk that had collected on those shelves. Now I just have this one small bookshelf that my father-in-law built in shop class a few moons ago. Eventually I would like the Studio to be painted a more serene color – pale pink perhaps? – and to replace this bookcase with something similar in size, but more girlie in feel, painted white or aqua perhaps? For now though I am happy with my little sewing space, and happy to feel like I am making some progress on our house, one little project at a time…. OK, I chocolate chip mint ice cream cone sounds like a perfectly wonderful breakfast to me 🙂 Your sewing nook is so pretty. I have resorted to eating raw garlic when sick before. It was not as yummy as roasted garlic, thats for certain! What is that folded blanket on the top shelf there? 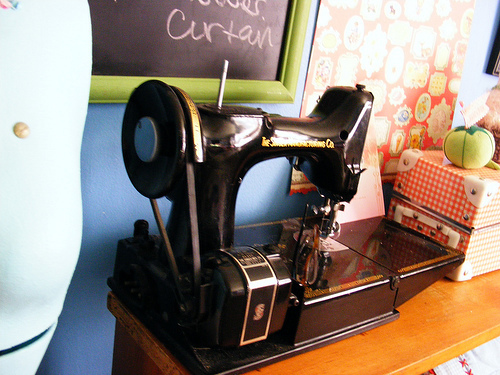 Your sewing room looks like a happy place to be. I just love it!!! Maybe that is why I rarely get sick, I LOVE garlic! I am glad you are feeling better! Your studio is awesome! I personally like the color it is, cause its so bright and cheery! Have a good day! Have a great weekend. Love the pictures of your studio. Ok, here is the mom weighing in. Calmly on the outside I say thank you daughter for at last using it not because I said so, but because it is a great healer. But on the inside I am having a rip snort party with balloons and confetti and ice cream and dancing, cause I WIN. (Oh wait a minute almost forgot myself) I really am so pleased you are feeling better. Have a good day! I’m intrigued by your sandwich combo! Love your sewing space. It’s perfectly adorable. Just like you. EEEP!!!! I LOVE love lOve your sweet little space! dontcha hate it when they are right! LOL! Completely adorable! You make me want to sew! 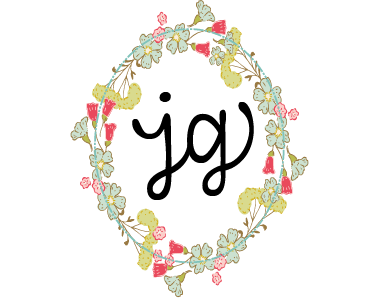 Your creative and adorable studio is wonderful!!! Love it and I’m sure you treasure your time there very much! I always love your inspiring spaces – you are sooooo talented!!!! !